Apple fans will be watching as the company unveils new iPads and Macs along with its latest OS X Yosemite operating system at a launch event in Cupertino, California, on Thursday. The company will be live-streaming the event for the iPhone, Mac and Apple TV users, and CNET will be on location to report live. This is expected to be a more low-key event than the media frenzy that surrounded the debut of Apple's iPhone 6, iPhone 6 Plus and Apple Watch last month. But the success of the iPad is important to the company's bottom line, and industry watchers are eager to see if the new models will boost Apple's tablet market share. 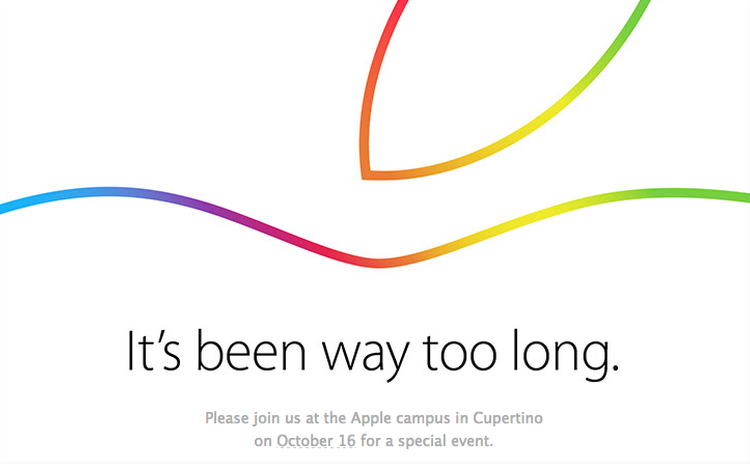 Apple announced the event last week when it sent out a cryptic invitation saying, "It's been way too long." Apple will be live streaming video of the event at this link beginning at 1 p.m. Eastern, 10 a.m. Pacific time. But it will only work on Apple devices running recent software. Mac and MacBook users must be running OS X version 10.6.8 or later, and using Safari version 5.1.10 or later. Or watch on an iPhone, iPad or iPod Touch with iOS 6 or later, using the Safari mobile web browser. You can also watch the event on second and third-generation Apple TV devices that run software version 6.2 or later. The stream can be accessed on the Apple Events channel on your device's main menu. No matter what kind of device you have, you can follow CNET's live blog of the Apple event here. "Preshow" coverage starts at 11:45 a.m. Eastern, 8:45 a.m. Pacific.